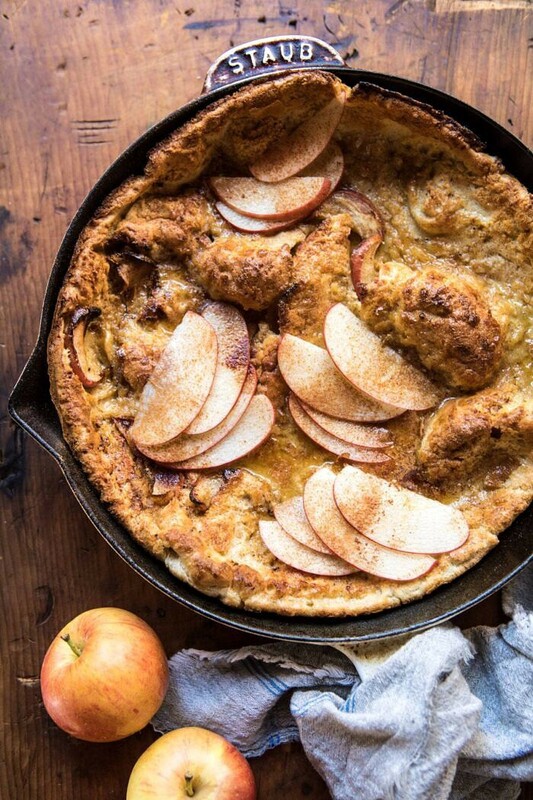 Cinnamon Apple Puffed Pancake…or a Dutch Baby as my mom and I like to call these. 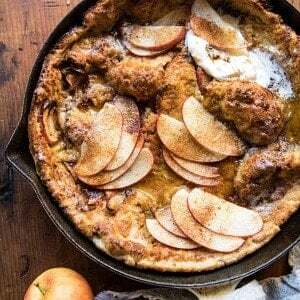 A skillet baked apple pancake infused with cinnamon and vanilla, made with both baked and fresh apples, and finished up with an addictingly good cinnamon butter maple syrup. This is the ultimate fall breakfast (or lunch, or breakfast for dinner) to feed family, friends, or even just yourself! The best part? It’s so easy to create and always turns out gorgeous! One of the many things that I love so much about September is apple season. I know there’s also a lot of talk about pumpkin, but I like to focus on all things apple, at least for most of September. And while I know that it is also pear season, if I am being honest, I much prefer apples to pears. 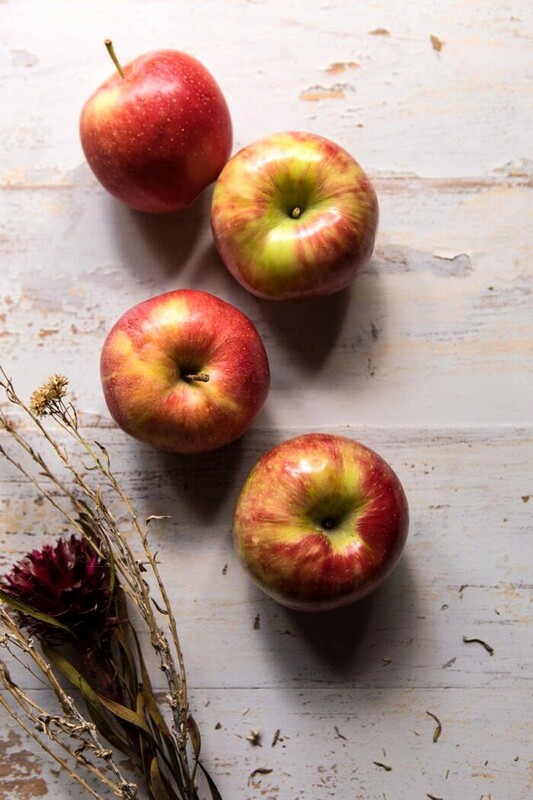 My point is that September apples are simply the best…how could I not share delicious new apple recipes. I kicked things off last Friday with these crumbly apple butter bars. I’m continuing on with the apple baking today with this cinnamon apple puffed pancake. 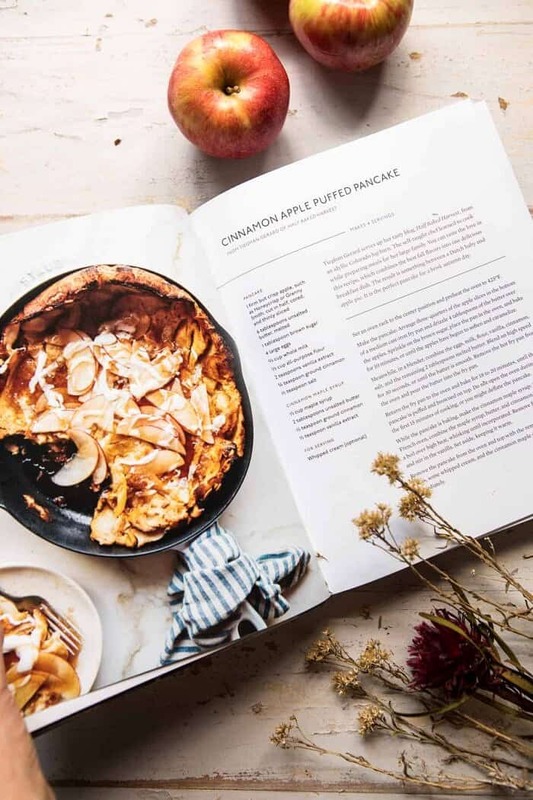 This apple pancake is a recipe I shared with my friends at Staub for their very own cookbook, simply titled, The Staub Cookbook. If you’ve been following HBH for any amount of time, then you know what a loyal Staub fan I am. It’s pretty much all I use in my kitchen when it comes to both cookware and bakeware. Staub is without a doubt my favorite, and has been for most of the life of this blog. Therefore, I’m sure you can appreciate my excitement when I was asked to share a recipe for their new cookbook. And a puffed pancake/Dutch Baby (whatever you’d like to call it), seemed like the obvious choice. 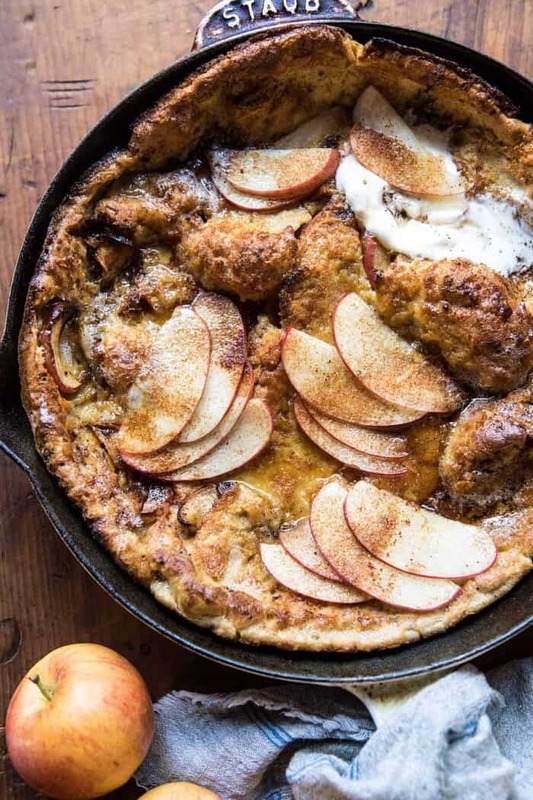 I’m all about a good puffy skillet pancake and this apple version is one I’ve been making since I first started cooking back when I was a teen. Before I dive into the details of this pancake, I want to tell you guys about The Staub Cookbook. 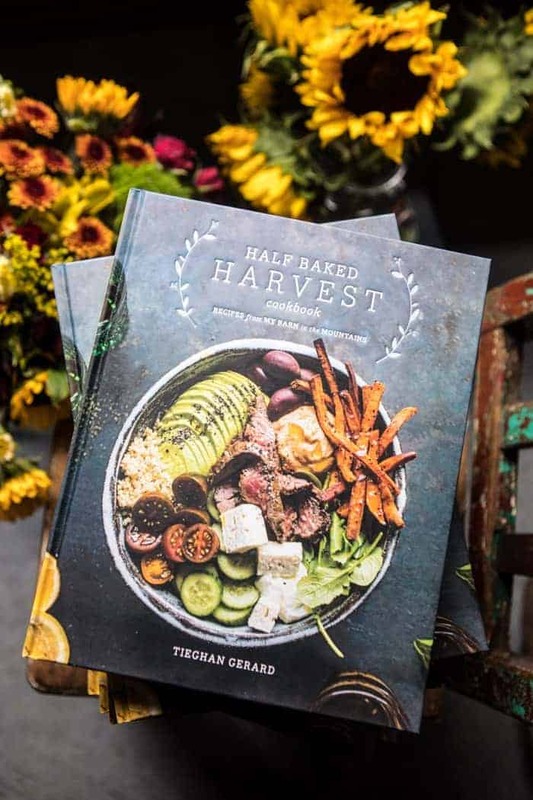 First things first, if you’re looking for a new cookbook for fall, this needs to be it. It’s full of cozy recipes that are easy, delicious, beautiful, and of course, all made using Staub Cast Iron or Staub bakeware. Honestly, when I first received the book in the mail, I was in awe of how pretty it is, but once I opened it up? Oh my gosh, I was so impressed. Each and every recipe is beyond amazing. I can’t wait to start cooking my way through. So many warming and cozy recipes. All perfect for the chillier days ahead, and especially for holiday entertaining. Trust me, if you enjoy my recipes, you will enjoy this cookbook. They are very much in line with each other. Got it? OK cool. You can order here. Promise you will not be disappointed. 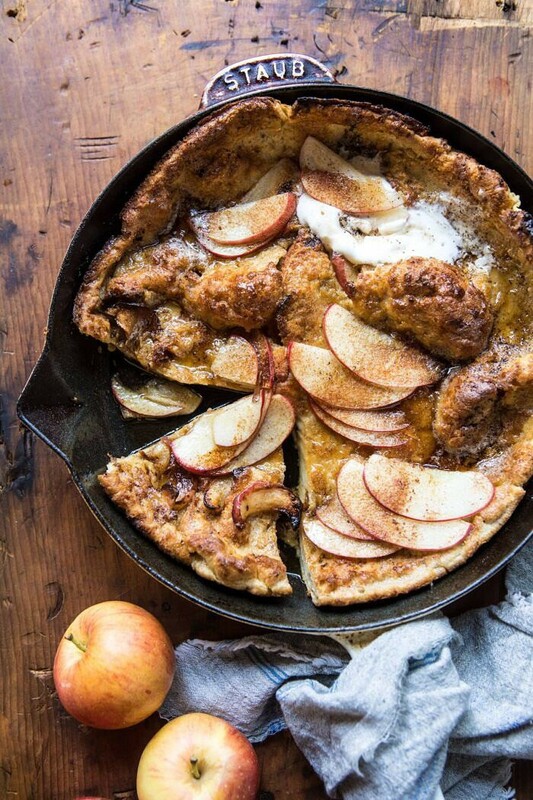 I’ve made A LOT of Dutch Baby’s, but oddly I’ve never shared a Dutch Baby involving fall apples. So glad to be changing all that today. When I first made this recipe (well over a year ago now), I could hardly wait to share it, it’s that good. To start, you’ll want to begin heating your skillet in the oven. The key to a good puffy pancake is a screaming hot cast iron skillet. The heat from the skillet causes the pancake batter to puff. It’s very scientific and I definitely cannot explain it, but all you really need to know is that it’s magical. During that same time, you’ll also add some thinly sliced apples, brown sugar, and butter to the skillet. The apples begin to cook, the sugar caramelizes, and the butter begins to brown. While that’s all happening in the oven, make the pancake batter. The batter is just your basic, egg, milk, and flour batter, but flavored with the additions of cinnamon and vanilla. Pour the batter into the hot skillet, full of buttery, caramelized apples, and then wait twenty minutes or so and done. You have a cinnamon apple puffy pancake. It’s going to smell amazing…but taste even better! Oh! And as if that wasn’t good enough, I also made a quick cinnamon butter maple syrup to drizzle overtop. Yum, yum, and YUM! You don’t have to make the syrup…but you should. 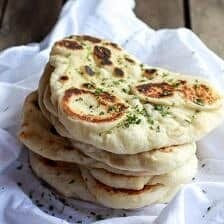 While I might say that every recipe is a favorite (because they really all are! ), this pancake just holds a special place in my heart. It’s a recipe my grandma taught me how to make, and one that my mom and I both love. It’s kind of our recipe, one that we love to make, eat, and enjoy together. So yes it is delicious, but it’s also just very special. Mom and I love making this best as a breakfast for lunch (or dinner) situation, but it’s truly great any time of day. Really hoping this sparks the idea that you should make breakfast for dinner tonight. I’m returning home from NYC on the late side this evening, and this Dutch Baby will be happening for dinner. For sure, I cannot wait, it’s the best….ENJOY! PS. 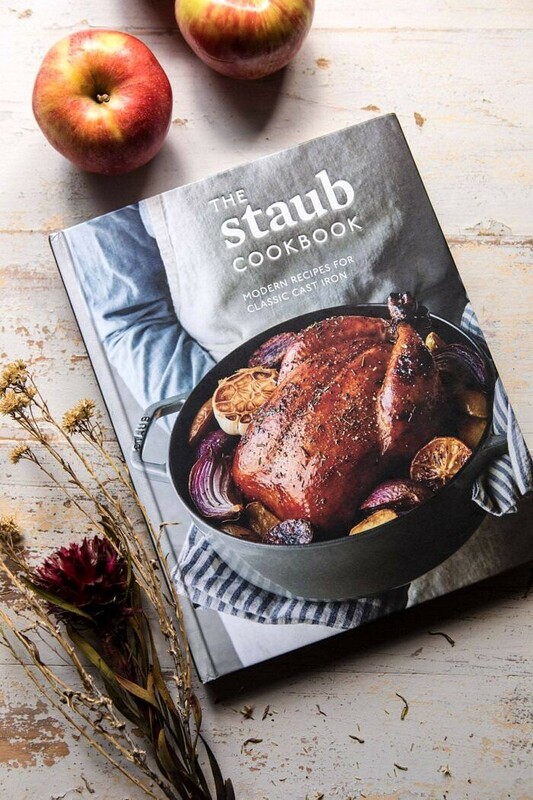 I will be doing a Staub giveaway over on Instagram, so be sure to check that out today! 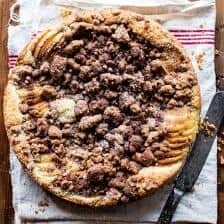 If you make this cinnamon apple puffed pancake, please be sure to leave a comment and/or give this recipe a rating! Above all, I love hearing from you guys and always do my best to respond to each and every comment. And of course, if you do make this recipe, don’t forget to also tag me on Instagram! 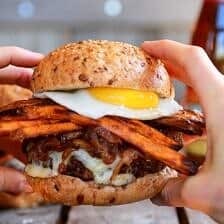 Looking through the photos of recipes you all have made is my favorite! 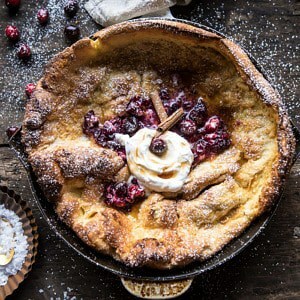 A skillet baked apple pancake infused with cinnamon and vanilla, made with both baked and fresh apples, and finished up with an addictingly good cinnamon butter maple syrup. This is the ultimate fall breakfast for your family, friends, or even yourself! The best part? It's easy to create and always turns out gorgeous! 2. Arrange 3/4 of the apple slices in the bottom a 10-12 inch cast iron skillet and drizzle 4 tablespoons butter over the apples. Sprinkle the brown sugar over top of everything. Place the skillet in the center of the oven for 10 minutes. 3. Meanwhile, in a blender, combine the eggs, milk, flour, vanilla, cinnamon, salt and the remaining 2 tablespoons melted butter. Blend on high for 30 seconds to one minute or until the batter is smooth. Make sure no large clumps of flour remain. Remove the hot skillet from the oven and pour the batter into the skillet. Place the skillet in the center of the oven and bake for 18-20 minutes or until the pancake is fully puffed and browned on top. Do not open the oven during the first 15 minutes of cooking or you might deflate your pancake. 4. 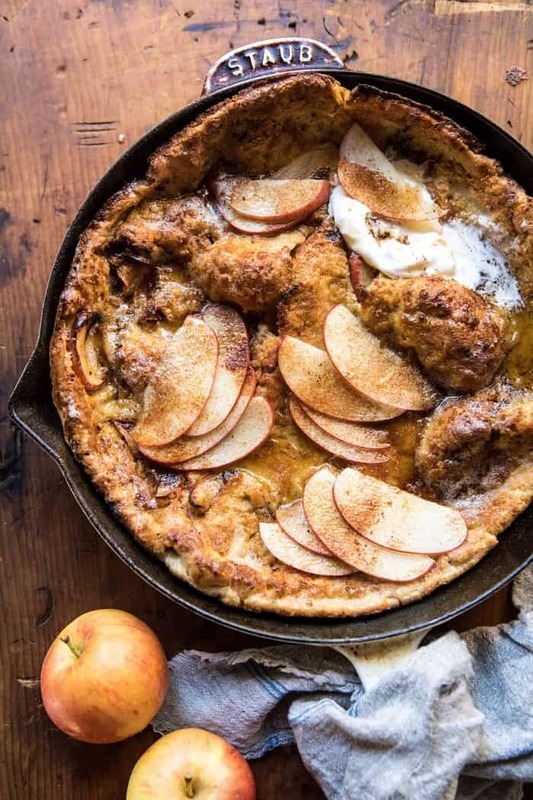 Remove the Dutch baby from the oven and serve topped with the remaining apple slices, whipped cream, and cinnamon syrup. 1. In a small saucepan, combine the maple, butter, and cinnamon and bring to a boil over high heat. Reduce the heat to medium and simmer for 3-5 minutes. Remove from the heat and stir in the vanilla. 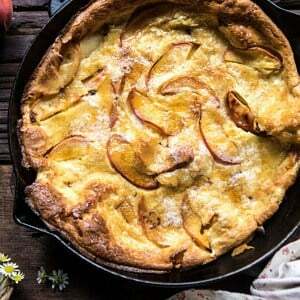 Serve warm aside the dutch baby. *Recipe written by Tieghan Gerard for The Staub Cookbook. I have never made nor tasted a puffed pancake. This looks yummy. Yes, apple recipes now, not pumpkin. I’ve never seen this before but wow – it sounds absolute delicious!! Good morning. I do not have milk but could use buttermilk instead. How does that sound? YES! I hope you love it Brittany! Thank you! This is so fall! Iove it! Will sure purchase this one. What lens do you use for overhead shots? Hi Marcin! Everything is linked under the photography tab on my shop page! I’ll link it below! I just have to say you knock it out of the park every time!!! Love love love your recipes:) Your blog is pretty much the only blog I cook from literally at least 4 times a week! Thanks for all the yummy recipes!!! Can’t wait to try this one with my boys! I own a little pie company up here in Calgary Alberta and your flavor combos are always inspiring me. That is so amazing! I am so glad you like my blog and I hope your pie shop is doing amazing! Thank you Sarah! Looks so good! 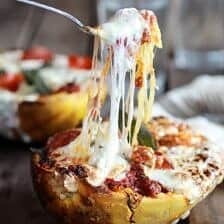 Can I make this in a nonstick oven proof skillet instead of a cast iron? Thanks! Apple season is the best, this pancake looks divine! Food is great, I will save the recipe. 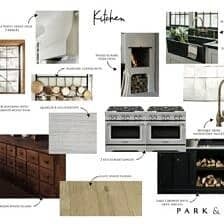 You cook well. Made this for breakfast this morning – so good! That cinnamon butter maple syrup! Made this for dinner tonight (my first time making a dutch pancake!). It turned out great. Thanks so much for the recipe, it will definitely be in my rotation when I need a quick & comforting meal (which happens a lot in the Fall)! Thank you so much Kayla! I am so glad you loved this! Breakfast creativity at its finest! It looks like a delicious cake that is perfect for the fall morning. Each slice of apple looks so crisp and flavorful–I bet it was tough not eating at least half of the pan! Loved this recipe!! I would like to make it as a dessert for a dinner party. 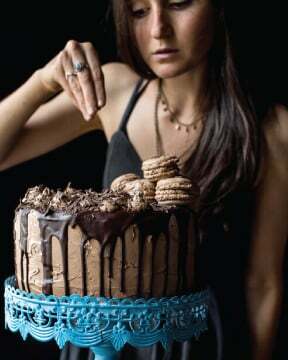 Do you think you could make the batter ahead of time? Thank you so much for all your recipes. They are amazing and you are adorable. I didn’t follow this recipe exactly because I already have a different dutch baby pancake recipe memorized. But I did add the cinnamon, vanilla, and apples part as well as the general process and it was amazing. My kids were unimpressed by the browned bits but I thought they tasted like caramel! The only problem is that I want to have it every morning for breakfast. Haha that is amazing! Thank you so much Lindsey! Tieghan, I know I’ve told you before, but all of your Dutch baby recipes puff up perfectly for me every single time. I love the combo of the apples, browned butter, brown sugar, and cinnamon in this. Perfect for this rainy, chilly, fall morning. Thank you for the recipe. This was simply a fun recipe to make. To see it when you open it up was amazing. The flavors were rich and wonderful and maple on the side was decadent. Family loved it! Thank you so much Bill! I am so glad you loved this and it turned out amazing for you! We just returned to Florida from Ohio with two pecks of orchard picked honey crisp apples. This was the perfect breakfast to use a few apples, and to convince us, that, just for a second, we were back in northeast Ohio! Thanks! I love that! I am so glad you enjoyed this Kendra! I am so happy to hear that! I hope you continue to love my recipes, Fatima! Thank you! I loved the recipe. It tastes delicious! This is magical! Followed recipe, and it came out perfect. Great presentation. me & Kids loved this, we had breakfast for dinner last night, served with a breakfast type sausage. 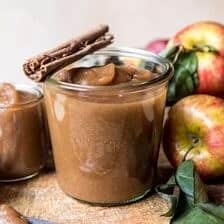 have extra apples on hand cause the sliced apples dipped in the cinnamon butter maple syrup,…. is thing now. my Grandma was awesome!….Grandma’s Rock! I am so glad you loved this! Thank you so much Karen! Yes, this was amazing. I did not use any fresh apples- I baked them all. I loved taking it out of the oven with it all beautifully puffed! Thinking of making this for Christmas morning. I am so glad you loved this Danielle! Thank you so much! Also, I hope it turns out just as amazing on Christmas morning! i made this over the weekend. It was very easy, fun to make and turned out great. I plan to make again! Thank you so much! I am so happy this turned out amazing for you, Stephanie! Snowed in, in Buffalo so decided to try this recipe after drooling over it for some time…amazing! And I didn’t have whole milk on hand so I subbed almond milk & it turned out great! The fresh apples on top add a nice crunch! Great recipe to make for a cozy brunch shared with friends. Thank you so much Melissa! I am so glad you loved this recipe!